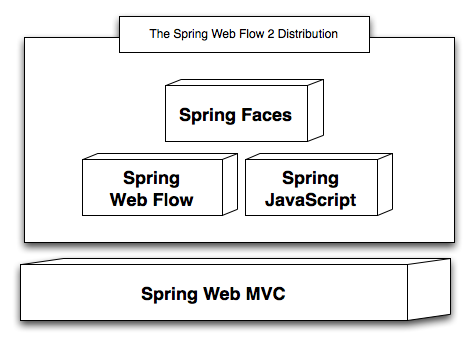 The Spring Web MVC framework, a module of the Spring Framework distribution, provides the foundation for developing web applications with Spring using the proven ModelViewController paradigm. Each of the modules of the Web Flow distribution builds on this foundation. The Web Flow module is a MVC extension that allows you to define Controllers using a domain-specific-language. This language is designed to model user interactions that require several requests into the server to complete, or may be invoked from different contexts. Web Flow 2 requires Java 1.4 or greater and runs on all major Java EE platforms including Tomcat, Jetty, Websphere, WebLogic, and JBoss. Web Flow 2 requires Spring Framework 2.5.4 or greater. Web Flow 2 has been certified by SpringSource as "Platform Ready" and is fit to run on the SpringSource dm Server in OSGi-enabled web applications. Get started using Web Flow by downloading the release and walking through the reference applications. Supplement with the documentation as you go to familiarize yourself with the feature set. To get started using a build system such as Maven or Ant+Ivy, access Web Flow artifacts from the Maven Central Repository. To get started using Web Flow in an OSGi environment on the SpringSource Application Platform, download the platform and get Web Flow bundles from the SpringSource Enterprise Bundle Repository. Explore Spring Web reference applications on-line. The Spring Travel application showcases the integrated Web Flow 2 feature set and is included in the distribution. The SpringSource Enterprise Bundle Repository is a real-world application in production built on Spring 2.5 and Spring Web Flow 2.0.